Our half term treat was a little unusual. Decadent even. Some kids might want to go to McDonalds for a school holiday lunch but we were very keen to try Burger and Lobster. And no it was the lobster we were all after, not the burgers. 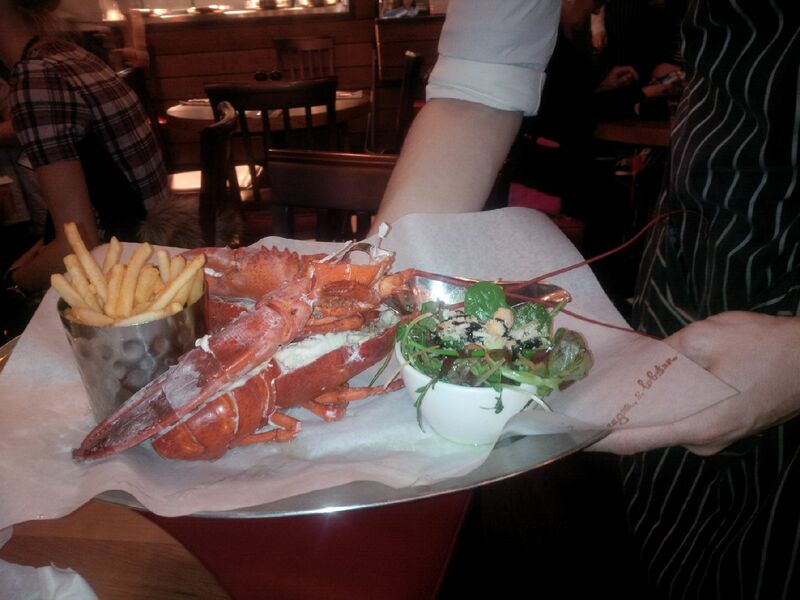 “We went to Burger and Lobster today for lunch. I was very keen to try lobster again. I had some of my mum’s once on holiday but it was ages ago. The waiters bought two silver metal trays of lobster and fries and salad and we shared this between three of us. The salad had a special ingredient of balsamic vinegar dressing which we like. The fries were similar to McDonalds ones. I don’t like McDonalds much but I do like their chips so this was not a bad thing. The lobster was large and delicious with a garlic and lemon butter sauce. They had bibs to protect your clothes but I did not want to wear one as I’m not a baby! Some of the grown-ups wear them though. It was quite a lot of work for my mum picking all the bits out of the claws with the picking stick but worth it for the extra. The drinks menu was confusing because it didn’t have anything like normal juices or water on it – nearly everything had alcohol but when we asked the waitress they did have lots of juices that weren’t on there. I chose pineapple. Is it a good place to take children? This is a restaurant with quite a grown-up, albeit informal, feel but we were still made very welcome indeed as a family. There were no qualms about our request for the extra plate for example and the waiting staff were kind and friendly to our eight-year-old. At the end we asked one of the waiters if they get many kids in. He said that it can be packed with them at weekends although they don’t have a children’s menu (or, it seems, do half portions). He added that they are hoping to introduce a kids’ menu soon…let’s hope they take our advice (see a previous post on this) and don’t dumb it down too much if they do (bread crumbed lobster nuggets anyone? Please NO!). Or better still they could just do smaller half portions of their grown-ups’ main courses and keep with their ethos of a very ‘finely tuned’ menu. Out of interest, we asked the waiter if child customers there normally have burgers or if some do opt for lobster – he was pretty adamant that nearly all, if not all have burgers. The burger we saw at the next table did look incredibly appealing but we think this is a bit of a shame. Lobster rocks! Give it a go kids! This post was not sponsored, we have no links to the company and we paid our way. There are five branches of Burger and Lobster in Central London. 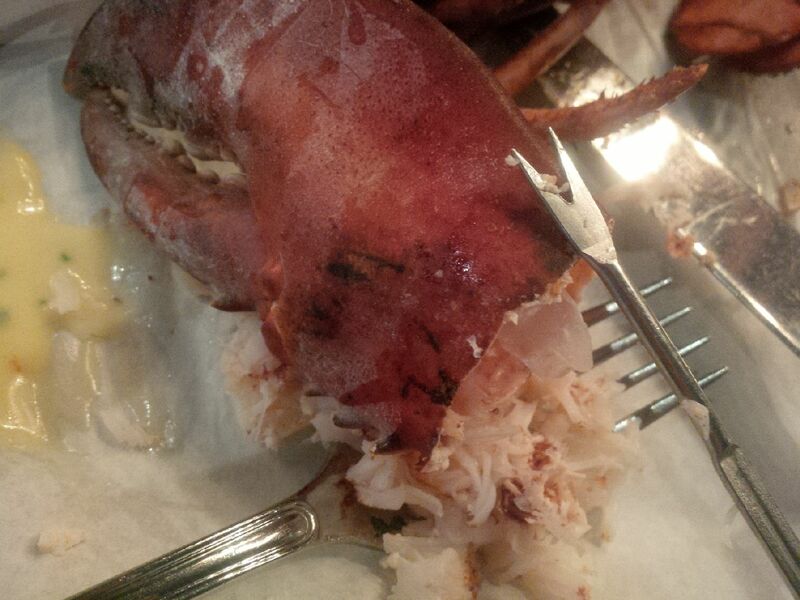 Please do not comment on the ethics of lobster eating…this is not the place for it. Thank you.